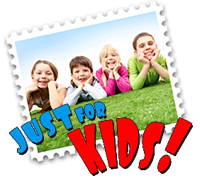 Kidstamps a free postal club to encourage young stamp collectors in the UK. Stamp collecting is a wonderful hobby that reflects your interest, does not need to cost a lot of money, and most of all is FUN! U.S. Symbols and Landmarks - Printable game (grades K-5). Presidential Crossword Puzzle - Printable game (grades K-5). Stamp Denominations - Printable game (grades K-5). My Stamp Story - Printable game (grades K-5). Who Decides What's on a Stamp? Young Stamp Collectors of America (YSCA) – Club open to youth ages 6 – 17. Young Philatelic Leaders - Year-long program for young stamp collectors ages 16 – 24. All Star Stamp Club - Click here to see if there is a club in your area. Complete all the requirements for earning a Boy Scout Stamp Collecting Merit Badge via an online workshop. The cost of $25 includes all materials and instruction. Contact education@stamps.org for details.